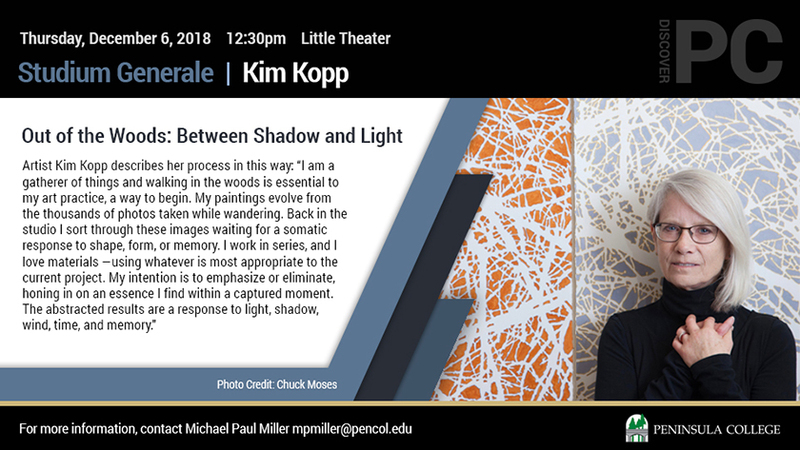 The final Studium Generale of Fall Quarter will feature an Artist Lecture by Kim Kopp, “Between Shadow and Light.” Join us on Thursday, December 6 at 12:30pm in PC’s Little Theater on the main campus in Port Angeles. A reception will follow in the gallery, where light refreshments will be available with many thanks to the donors who have contributed to the Peninsula College Foundation. In 1993, after completing her MFA at the University of Chicago in 1992 (Full Merit Scholarship) plus a BFA from the school of the Art Institute of Chicago (1987), Kopp migrated to the Olympic Peninsula landing at the Northwest School of Wooden Boatbuilding in Port Townsend, WA. There she learned to work with wood and reshaped her vision of an art making career. Since that time she has been an EDGE Professional Development participant (2005) and a GAP Grant Recipient (2002), both awarded by Artist Trust, Seattle. Kopp was an Artist in Residence at Jentel in Wyoming (2013) and Centrum Arts in Washington (2002), Represented by SAM Gallery, Seattle, WA, she exhibits widely in the Pacific Northwest and Nation-wide from Hawaii to the Midwest, and has works in several notable collections. Kopp lives and works in Port Townsend WA.